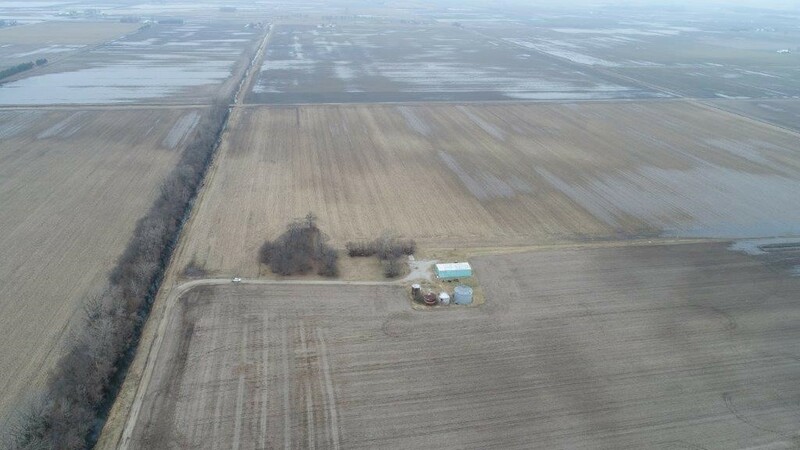 Recent widespread flooding for weeks in northern Indiana has prompted questions and concerns about the potential negative effects on soil biology and other soil properties. In contrast to flooding events during the summer, flooded soils in late winter would be expected to have relatively little impact. Soils are still cold and soil biological activity is still at a low level. Typically it is difficult to detect respiration from cold soils, as microbial activity is shut down for the winter. This means that respiration by the soil organisms was at a low level anyway, and the oxygen demand from the organisms would be low. Even if oxygen was depleted in some fields, the organisms haven’t really “woken up” from their winter naps, and the negative effects should be minimal. It is also important to remember that microbial populations in soil exceed 100 million cells per gram of soil. It is extremely difficult to completely remove or reduce this population as soil organisms have various resting stages, spores, etc., that can withstand harsh conditions for prolonged periods and then regrow again when conditions improve. Microbial populations in soils are composed of 1000s of different types of bacteria and fungi. These will have a range of abilities that are functional across a spectrum of soil conditions. What is active in summer may be different from what is active in fall or under wet conditions. As soils dry out and warm up, the structure of the population will shift in response to conditional changes. Earthworms are mostly also still in their winter resting stage, and cocoons would be able to tolerate the flooded conditions and hatch out after conditions become more beneficial. Nitrogen loss from soil can occur via leaching of nitrate below the rootzone or into tile drainage. Fortunately, in most situations little nitrate-N is present in the soil during winter, because the majority of N applied as anhydrous ammonia or manure in the late fall and early winter or mineralized from crop residues and soil organic matter will likely remain in the ammonium or organic (in the case of manure) forms which are not subject to leaching. The exception to this would be manure applied in summer which would have had ample time and temperature to convert to nitrate and therefore losses of N could be substantial. Nitrate can also be denitrified under flooded conditions by soil microorganisms to gaseous forms of N which are then lost to the atmosphere. However even if nitrate were present, losses via denitrification would be minimal with cold temperatures and limited microbial activity. The physical conditions of the surface soil may deteriorate from the flood waters, with aggregates breaking down and causing surface crusting and somewhat higher bulk densities. Ideally, cover crops could help reform those aggregates, but that practice doesn’t fit at this time of year. Soil freeze/thaw and wetting/drying cycles between the flooding period and the planting period will also help with surface soil structure recovery. We don’t recommend deep tillage operations to attempt mechanical restoration of soil structure; deep tillage in spring carries too much risk of smearing wetter soils at depth and in losing soil moisture in dry-weather springs. Shallow strip-till operations can improve seedbed soil quality if crusting persists. For some perspective, remember that our floodplain soils in Indiana are some of our most productive soils, and they flood nearly every year in winter sometime. Many of the ponds and lakes formed in low-lying sections of Indiana fields are now apparent only by the “stover residue rings” that are left behind. These may need to be moved or carefully burned so as not to interfere with planting operations. Residue rings are often more dominant following fall vertical tillage operations resulting in shorter pieces of unanchored corn stalks that float easily. Flooding prone sections of fields are never the best places to do shallow fall vertical tillage. Bottom line—probably not worth worrying about the soil biology effects of this past winter’s flooding.